Pyrenees Collection makes getting to the Pyrenees easy, offering self-drive ski holiday packages. We offer Eurotunnel with free FlexiPlus upgrade as well as ferry crossings. Read on to find out more about our self-drive offerings and the benefits of driving to the French Pyrenees. WHY FLY? WHEN YOU CAN DRIVE! Driving is by far the most flexible option, where you are in control of your own timetable, can take as much luggage as you need (including ski equipment at no extra charge), stop en-route as and when you choose. You can also stay in more than one resort and take day trips to areas of interest, while maximising your skiing and leisure time in the resort. 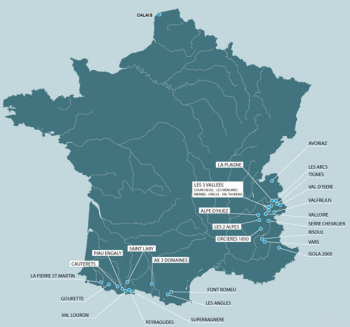 Pyrenean resorts are just 2 hours further by road from the majority of French Alps resorts. Because we have negotiated great prices with the ferry companies and Eurotunnel we are able to offer the best value for money possible. For full self-drive package price details, please refer to the relevant residence page on the website. Some supplements for peak dates apply, please see below. All our inclusive holidays now include a return Eurotunnel crossing from Folkestone to Calais with a car with Free FlexiPlus upgrade, giving you not only the complete flexibility to travel on the next available departure but also a dedicated Check-in lane, priority boarding and use of dedicated lounge facilities with complimentary facilities (cars below 1.85m high only). For independent travellers we can offer accommodation-only bookings. Relax and enjoy the journey without having to worry about arriving on time for your departure. Leave from home or from the resort when you are ready and avoid the stress of having to meet a particular departure. Once you are in your designated FlexiPlus lane, you will be boarded on the next shuttle ahead of other passengers. Remember, first on, first off and onwards to your destination. If stopping off for a bite to eat or last minute shopping then you are entitled to park in the designated spaces close to the Passenger Terminal Buildings. The lounge opens 06.00 to 22.00 daily, offering you complimentary non-alcoholic drinks and light meals. Relax in comfortable surroundings with a free newspaper (one per car) or take advantage of telephone/fax/internet access facilities. There is a small shop for any last minute purchases. On your return enjoy the French FlexiPlus lounge; shop for alcohol and confectionery at fabulous French prices. Due to safety regulations of the FlexiPlus lounge parking area, vehicles over 1.85m high are not permitted to access the lounge facilities (but you can still enjoy all the other benefits). See residence pages for full self-drive package prices. FREE FlexiPlus upgrade available on selected dates. IMPORTANT: LPG vehicles not permitted. If you would like to stay close to the Eurotunnel terminal the Holiday Inn Express is the hotel our directors would recommend from personal experience. The hotel is new, good value and it is the closest hotel to the terminal. The Express by Holiday Folkestone is situated very conveniently for the Channel Tunnel and Dover Ferry Port. Ideally situated next to J12 of the M20, five minutes from the Euro Tunnel and ten minutes from the Dover Ferry Port, the hotel is ideal for those stopping over en route to France. Rooms sleep 2-4 in either double, twin or family rooms. The rooms have air conditioning, direct dial telephone, TV, tea/coffee maker, radio alarm clock, desk, cot on request and are non-smoking. The bathroom has a hairdryer. Additional information - pets welcome at a charge. View the following link to check availability, prices and to book a room (plus full room description) at the Holiday Inn Express Folkestone: Click Here. Alternative routes and operators such as Dover-Calais, Hull to Zeebrugge/Rotterdam or Portsmouth-Caen are also available. Some supplements or reductions may apply, please see below. Save miles in the UK and arrive first thing in the morning fresh and ready for your journey in either Zeebrugge or Rotterdam. 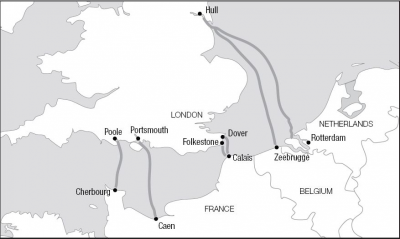 Zeebrugge to the Alps is roughly the same distance as Calais whilst Rotterdam adds about 70 miles. The P&O ferry terminal is in Europort which lies approximately 24 miles from the centre of Rotterdam. On board accommodation has to be booked on overnight crossings with P&O Ferries from Portsmouth & Hull and Brittany Ferries, please enquire for cabin and Club Class seat prices. Please note that the supplements shown are calculated on the basis of our tour operator allocated space. Occasionally, space may not be available at these fares, in which case we may have to charge the operator's full brochure price. If this occurs, it will, of course, be made clear to you at the time of booking. The same operator must be used for the outward and return journey. On Saturdays when it is snowing, Police/Gendarmerie will often stand at the bottom of these roads and will prevent any vehicle without special equipment from going any further. Cars equipped with snow tyres will only need to add chains if snow is very deep and has not been cleared at all (when driving out of a steep driveway for example). Snow tyres are also not so good on pure ice. 4x4 vehicles make it a lot easier to drive in snow conditions but snowchains are still required in certain circumstances, so the advice is still to have them even with a 4x4 vehicle. Snowchains are like insurance. You will be extremely glad you have them if you arrive in the French Alps late at night and find yourself stuck 20 miles from your final destination or if you get stuck early in the morning trying to get out of your car parking space in the resort on the day of departure and there is no one around to help you!